With the college football season just around the corner, we turn our attention to the Georgia Bulldogs. Our own Tyler Donaldson will be breaking down position group by position group, leading up to kickoff on September 1st against Austin Peay. ESPN Savannah 104.3/1400 and ESPN Hilton Head 92.7/1400 will be your radio home for the Dawgs in 2018! The Nick Chubb and Sony Michel era is over in Athens. One of the greatest running back duos to grace college football has moved on and Georgia will have to replace their immense production in the 2018-2019 season. Luckily for the Bulldogs, they have a plethora of talented backs hungry to fill Michel and Chubb’s shoes. 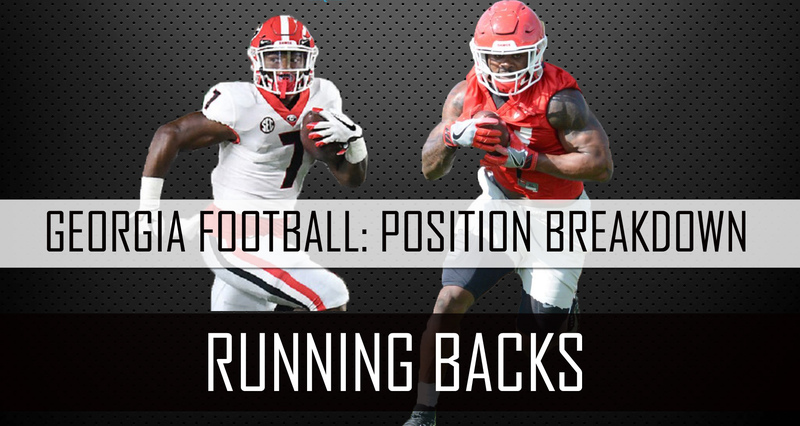 Unlike the quarterback depth chart, the running back position possesses immense depth. There are five running backs on the roster that could see time this year and contribute in some form or fashion. D’Andre Swift leads the group as the all-but-named starter. Behind him are returning running backs like the powerful Elijah Holyfield, and speedster Brian Herrien. However the two wild cards are highly touted prospects James Cook and Zamir White. Smart has a lot of mouths to feeds, but in Georgia’s run heavy offense there should be a good amount of touches to go around. Swift was the third back in Georgia’s deadly running attack last year. The Philly product burst on the scene and as the season progressed Coach Smart leaned on him more and more and for good reason. Swift averaged 7.6 YPC on 81 carries last year. That is insane production from a freshman running back despite his small stature. The Philadelphia native ended up with 618 yards and 3 touchdowns last season, but his value doesn’t end there. Swift showed that he was just as valuable in the passing game. With 17 receptions for 153 yards, Swift averaged nine yards a catch. These numbers are obviously a small sample size due to a smaller workload behind Chubb and Michel. But if Swift can extrapolate those results over a season… Georgia is looking at possibly one of the best running backs in college football history. Speed, balance, agility, Swift possesses all of the traits to be a workhorse back for the Bulldogs. If there was on player one the team most likely to win the heisman trophy, this is your guy. The good news for Swift is he doesn’t have to do it all himself. Coach Smart and his staff have done a great job on the recruiting trail and brought in a pair of high school prospects that are both likely to get time from the start of the season. Zamir White was the number one running back prospect in the country and it’s not hard to see why. White stands at 6’1, 210 lbs and his production is off the charts. The North Carolina product averaged 9.7 yards per carry at Scotland High School and racked up 7,169 yards and 119 rushing touchdowns in his high school career. White possesses an exciting blend of speed and strength and bullied opposing defenses all four years during high school. Being from the same state as Todd Gurley, and with Chubb and Michel moving on, there’s a lot of expectations for White to be the “next great back” for the Bulldogs. White tore his ACL during his final season at Scotland and has been rehabbing to be ready for the season. Coming off that kind of injury is never easy, but with so many talented running backs around him he will have plenty of time to heal up and meet those lofty expectations. Expect to see a good bit of White as the season progresses as a compliment to Swift and to help ease Swift’s workload as a two down back. The other incoming running back is as electrifying as they come. James Cook, brother of Minnesota Viking Dalvin Cook, picked the Bulldogs over Florida State, Miami, and Alabama. Cook is fast. Like blazing, scorched earth fast. He used that speed to rush for 782 yards and 10 touchdowns on 91 carries in his senior season at Miami Central High School. Cook averaged 8.6 YPC at Miami Central and also played defensive back. His speed is a major asset for the Bulldogs. Cook can be utilized as a third down back right away and his ability to create home-run plays could be very reminiscent to what Swift came in and did last year for Georgia. Cook will most likely play more than his counterpart White from the beginning of the year thanks to his unique skill-set and ability as a receiver. His pass catching ability will open up the offense for Jake Fromm immensely and might be an immediate playmaker on the Bulldog’s offense. Returning alongside Swift are Elijah Holyfield and Brian Herrien. A yin-yang situation if you will. Holyfield showed some promise late last year when he was given the opportunity, while Herrien seemed to struggle in his second season after making some splash plays his first year with Georgia. It will be tough for these guys to carve out a large role with such naturally talented running backs in front of them. Herrien is a quick runner like Cook and runs way harder than his weight. However, his inconsistent production, mixed with Cook coming in with a similar set of traits, it could be hard for Herrien to see any more touches than he did in his previous two years (63 as a freshman and 61 as a sophomore). All in all a nice complimentary piece, but there are a lot of mouths to feed and Herrien’s might be the one that ends up with table scraps as the season moves on. Holyfield hasn’t really been given much opportunity thus far in his collegiate career. Labeled as a workout warrior, Holyfield showed promise last year in his limited amount of touches averaging 5.9 YPC. In total, he ran for 293 yards and two touchdowns. Holyfield has a powerful style to his run game. If reports are true from the Georgia camp of him being much stronger and faster, he could be the dark horse candidate to see a major boost in touches this season. With White probably being eased in due to injury, expect to see Holyfield’s number called quite a bit to alleviate Swift’s workload early on. And, if Holyfield can produce during that time, Smart has shown he will ride the hot hand if that ends up being the case. The Bulldogs are flooded with talent at the running back position. All five guys are starter caliber players in the SEC at the running back position and offensive coordinator Jim Chaney is going to be like a kid in a candy store with all the playmakers he has to choose from. Georgia is known for it’s heavy and efficient running attack, and this upcoming season won’t be any different.